CalfBrew now available through all Farmlands and PGG Wrightson stores nationwide. The latest addition to the BioBrew range of fresh probiotic products is CalfBrew, the finest microbial tool available, designed to bring your calves through their first year in their best condition at a truly affordable price. Developed through Callaghan Innovation-funded research at Lincoln University, CalfBrew is formulated with MPI GRAS-Registered microbes including our proprietary Lactobacillus reuteri MFC-2, selected to give your valuable calves the advantage they need to become top producers in your herd. 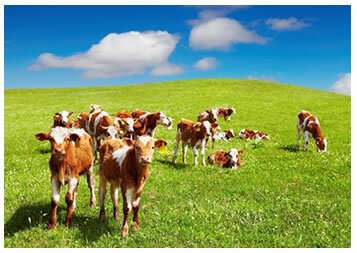 CalfBrew may be used from birth, through weaning, and all the way to being fully developed grazers. CalfBrew is administered in milk or milk replacement prior to weaning and in stock water post-weaning. Calves with signs of scours may be directly drenched until symptoms subside. or order some from your local Farmlands. Calves: 5-10ml/day (per calf) in milk or milk replacement. After weaning, can be added to stock water. Can be used as a direct drench. Lambs & Kids 3-5ml day mix with feed, water or direct drench. We recommend a higher dose for the first week of administration and a lower maintenance dose for everyday use. Scouring animals may be drenched with 30-50ml per day until symptoms subside. CalfBrew may be administered via stock water, feed, or direct drenching. For calves, CalfBrew may be added to milk or milk replacer. No special handling requirements. Eye contact: flush with water. BioBrew has an ongoing quality control program that includes regular independent testing of products by Lincoln University. Please also view the BioBrew Ltd. Product Safety Data Sheet.